Bicycle accidents in Massachusetts occur all too often. Many bicycle accidents involve a vehicle or another bicycle, or happen because of a poorly paved road or road debris getting in the way. Do you know what to do in the event of a bicycle accident in Boston or elsewhere in the state? Our Boston bicycle accident lawyers offer a complete checklist for what to do in case you find yourself in a bicycle accident. First and foremost, you want to make sure that you’re safe. If you’ve fallen, you want to make sure that you don’t move until a medically-qualified person checks you to make sure you’re not seriously injured. Beyond what needs to be done to make sure that no bones are broken and that you’re not bleeding, you’re going to want to lay there for a couple of minutes. Try not to panic, but relax to calm down and collect your thoughts. 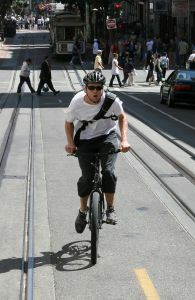 If you or your bicycle is in harm’s way, you want to make a note of where your bicycle and you were after the accident. If there are motor vehicles involved, make a note of their location before they move clear of traffic. You’ll need this information to give to the Registry of Motor Vehicles and for law enforcement officers when you fill out a report for the accident. If medical responders are called to the scene, do not refuse assistance unless you are absolutely positive you’re not injured. If you have the smallest of doubts, allow qualified medical assistance to help you. –Identify Principals: You’re best bet is to see the driver’s licenses and registrations of people and vehicles involved in the accident. Jot down their names, driver’s license numbers, insurance companies and addresses. Try to get the same information from witnesses, too. Take note of the injuries that were suffered by other people who were involved in the accident. –What if a driver leaves the scene? : If a driver has been involved in a collision and leaves the accident site before providing identification, he or she has broken the law. Get the license plate number if you can. Give this information to police immediately and then once again when you file an accident report. –Check out your bicycle: Even if you think you’re ready to get back up and ride, don’t do it if your bike has been damaged. Oftentimes bicycles can be damaged beyond our knowledge and can contribute to a serious accident in the future. If you do decide to call a cab, consider grabbing a receipt for the ride as you can get reimbursed after filing a claim with the insurance company. -According to state law, you need to file a report within five days for an accident that injures someone or results in property damage of more than $1,000 You can grab one of these reports from a police station or on the Massachusetts Department of Transportation’s RMV website. When you fill out the report, make four copies and send one to the Massachusetts Registry of Motor Vehicles, one to the police department nearest the accident site, one to the insurance companies and keep one for yourself. If you or a loved one has been injured in a bicycle accident in Boston or elsewhere in Massachusetts, contact Boston Personal Injury Attorney Jeffrey S. Glassman for a free and confidential appointment to discuss your rights. Call 1-877-617-5333.